Here the blue is ascending air velocity and the pink is descending. 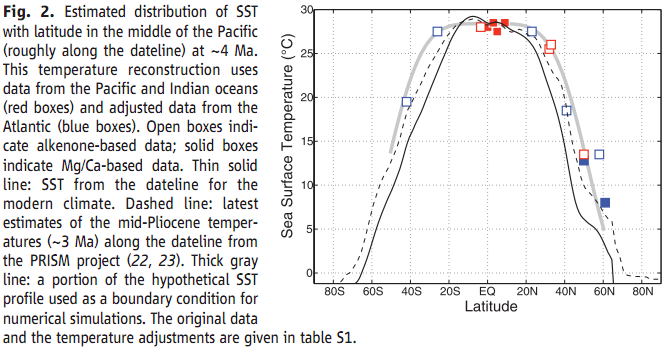 The main point here is the difference between the soft grey line (postulated Pliocene) and modern (thin solid black line). Note the huge shift - we are talking about 10o-15o of latitude so in the ballpark of a thousand miles in both directions. 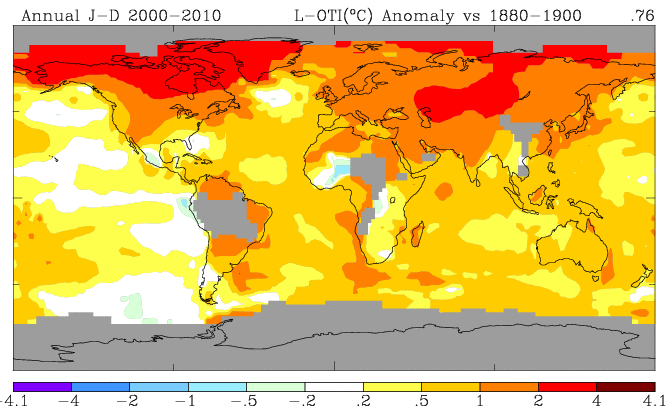 Obviously this chart relies on a rather small number of data points and the need to translate from the Atlantic speaks volumes - so it's probably indicative rather than dispositive. You want to look at the shrinkage of the pale/violet zones in the Pliocene map at bottom. 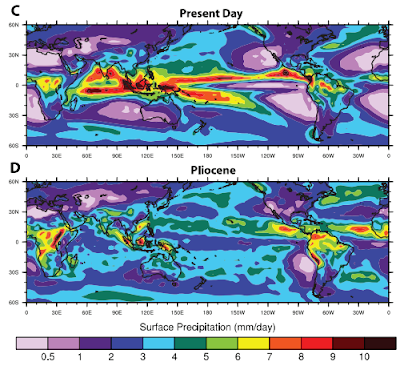 So the picture that emerges is that the Pliocene climate involved more widespread (and gentler) rainfall than the pre-industrial modern climate but that this was predicated on a much warmer ocean that extended tropical conditions much further north and south than the present ocean temperature distribution. 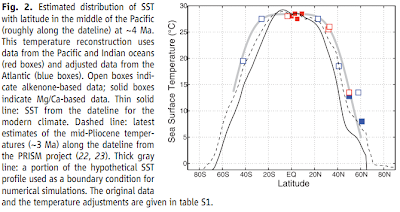 Clearly the oceans have warmed much less than the land - and a lot of the eastern Pacific has barely warmed at all (presumably because this is the site of a lot of upwelling of deep old ocean water). Thus even if we've created a Pliocene concentration of carbon dioxide in the atmosphere, it will be a long time before we have a Pliocene ocean and thus a Pliocene weaker Hadley cell and gentler distribution of wet and dry (assuming this provisional picture of the Pliocene climate turns out to be right). 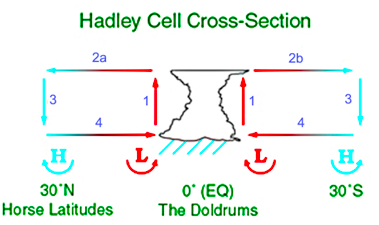 Thinking about the paleo changes, it is hard to see a world without a Hadley cell, which is what some of the no-Sahara stuff might seem to imply. 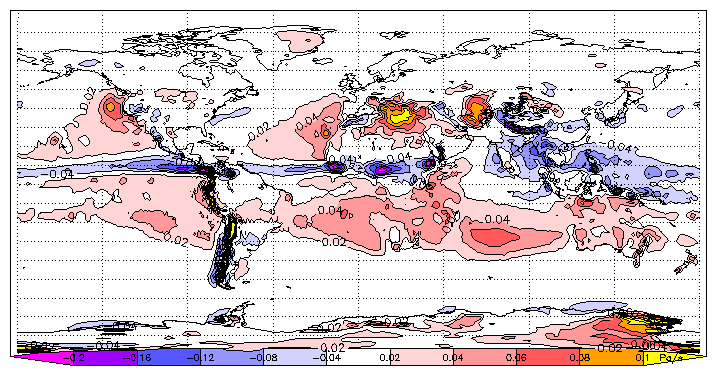 The solution is likely to be / possibly in the seasonal migration: the ITCZ somewhat follows the solar equator, but with variations, so altering things a bit might get you from a permanently dry area into one with rain half the year at least, say. You can play with the data from ECMWF here: http://data-portal.ecmwf.int/data/d/era40_mnth/levtype=pl/ if you like; you want the vertical velocity on the 500 hPa surface. Belette - but that would just move the desert, not shrink it? Also - thx for the loan of your pic!